Faithful folks in West New York, N.J., say a section of bark on a city tree is an apparition of the mother or Christ. WNBC's Gus Rosendale reports. 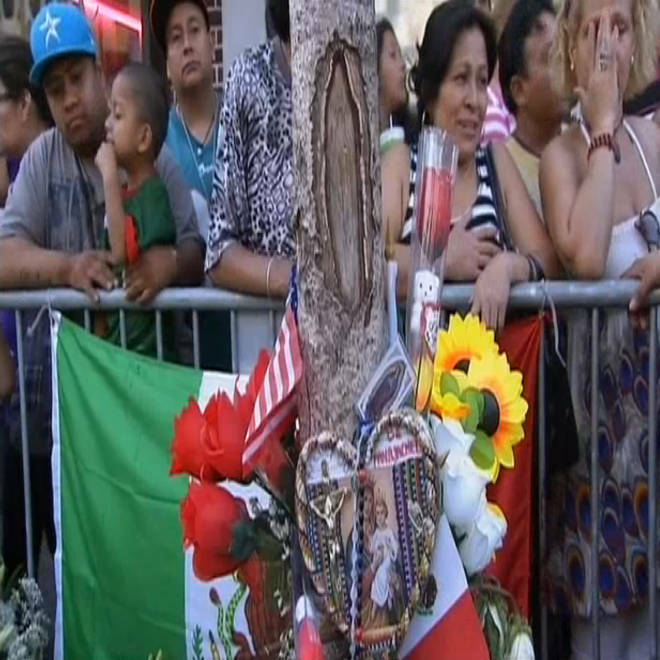 WEST NEW YORK, N.J. -- Hundreds of Catholic faithful and curious onlookers descended on a West New York street Thursday, eager to visit a tree that many are convinced bears an image of Our Lady of Guadalupe, the Virgin Mary as worshipped in Mexico. The crowds gathered around the tree on Bergenline Avenue, leaving piles of flowers and praying as they touched the tree. "As soon as I got here, I felt this rush when I saw it, this rush from my body," said Barbara Questel of West New York. "It's such an amazing feeling." Johanna Ramos was among the first to spot the image earlier in the week. "It took me awhile, but when I realized the colors and shape of it, it was really noticeable," she said. The crowds grew so large, police set up barricades to protect people waiting in line from traffic. "It's excellent," said Bacher Archnir of West New York. "A lot of people come and believe." Visitors to the tree lingered into the night. Barricades around the tree will remain, as police expect the number of visitors to grow. Catholic faithful say the scar on a tree in New Jersey resembles Our Lady of Guadalupe, the Virgin Mary as worshipped in Mexico.